Education Centre: Check out our new articles here. Starting April 1, 2014, associates can earn advertising fees by driving mobile traffic to Amazon’s EU sites from their mobile-optimized website. For mobile websites: In most cases, you won’t have to do anything different to monetize your mobile-optimized websites. 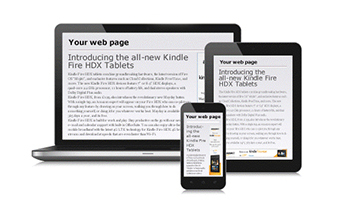 You will earn the same fees and use many of the same tools to refer your mobile web users to Amazon’s EU sites. Unless noted, our Links and Banners work on mobile-optimized websites. For client-side software applications: Links in client-side software applications, including mobile apps, are still restricted under the EU Operating Agreement and require our approval. How has Amazon EU Associates’ mobile policy changed? Prior to this announcement, Amazon EU associates were not permitted to integrate affiliate links into their mobile-optimized websites. Today Amazon EU associates can monetize any type of website through our programme. I’m already an Associate. Do I need to sign up to earn advertising fees on mobile-optimized web? No, but you should make sure your existing links work properly by using mobile-ready Associates tools. Unless noted, our linking tools will work for your mobile website. Tools like our Flash-based widgets show an icon and message: "This widget/banner may not work for mobile devices" so you can avoid using them on your mobile websites. What fees will I earn from my mobile-optimized website? You will earn advertising fees consistent with the existing Amazon EU Associates programme and will use one Associates ID for all of your traffic. Purchases through mobile, tablet and PC websites will all earn advertising fees under the same fee structure. Visit the advertising fee schedule page to learn more. Will I earn advertising fees if a user clicks on a mobile-optimized web link and then purchases an Amazon EU product on their PC? Yes, if the user added the item to their cart after clicking the link on your mobile-optimized webpage. An Amazon EU associate receives credit when a customer adds an item to their Amazon EU cart after following a tagged link, and purchases that item from any device within 89 days. Unfortunately, we cannot pay advertising fees on cross-device activity if the user does not add the item to their cart. Will any mobile-optimized website be allowed to earn advertising fees? Standard and mobile-optimized websites are subject to the same guidelines as described in our EU Operating Agreement. The Amazon EU Associates programme will work best for you if you offer unique content to your users and link to Amazon EU products that are relevant to your content. Do you have a suggestion or comment about the Associates Central website? Let us know.